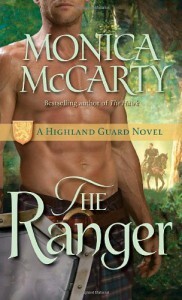 Overall, another great highlander romance by Monica McCarty. It started a wee bit slow, but when it picked up I couldn't put it down. I have to say how much I love that this author always writes heroes and heroines who must move mountains in order to make the relationship work. There are no 'big misunderstandings' or silly obstacles to get around, they literally must triumph over true hardships to find their HEA. In 'The Ranger' not only are Arthur (Ranger) and Anna are on opposite sides of the war, but Anna's father (whom she adores) killed Arthur's father 14-years earlier. This book kept me guessing and wondering all the way to the end about how they are going to get an HEA! The only reason I didn't give this a full five stars is because I felt there was more 'telling' than 'showing' going on than her other books. I would have liked to see more relationship building dialogue/storyline between Arthur and Anna. Too often we were told they spent time together or lusted over each other, but I prefer seeing that instead of being told about it. I would also recommend reading the series in order to get the full meaning of the battles taking place in the book, but it could be read stand-alone. The war is progressively being won throughout the series, and I do think some of the story may not make as much sense if read out of context.